JIRA System Administrators – Permission to perform all JIRA administration functions. 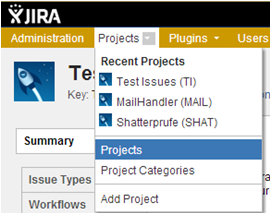 JIRA Administrators – Permission to perform most JIRA administration functions. A user with JIRA Administrators will be able to log in to JIRA without the JIRA Users permission, but may not be able to perform all regular user functions (e.g. edit their profile) unless they also belong to a group that has the JIRA Users permission. JIRA Users – Permission to log in to JIRA. Browse Users – Permission to view a list of all JIRA user names and group names. 1. Depending on the Jira version, Choose Issues > Issue Security Schemes to open the ‘Issue Security Schemes’ page, which lists all the issue security schemes currently available in your JIRA installation. 3. In the Add Issue Security Scheme form, enter a name for the issue security scheme, and a short description of the scheme. Then click the Add button. 4. You will return to the Issue Security Schemes page, which now contains the newly added scheme. 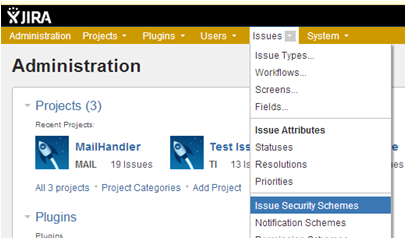 Choose Issues > Issue Security Schemes to open the ‘Issue Security Schemes’ page. Click the name of any scheme, or the link Security Levels (in the Operations column) to open the Edit Issue Security Levels page. In the Add Security Level box, enter a name and description for your new security level and then click Add Security Level. You can choose to specify a Default Security Level for your issue security scheme. 1. 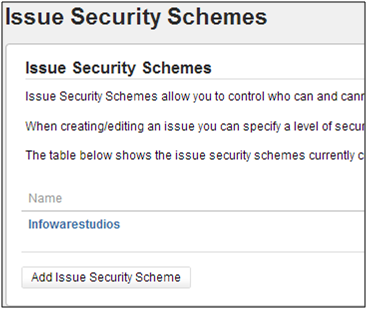 Choose Issues > Issue Security Schemes to open the ‘Issue Security Schemes’ page. 2. Click the name of any scheme or the link Security Levels to open the Edit Issue Security Levels page. To set the ‘default’ security level for an issue security scheme, locate the appropriate Security Level and click its Default link (in the Operations column). To remove the ‘default’ security level from an issue security scheme, click the ‘Change default security level to “None”‘ link (near the top of the page). Click the name of any scheme or the link Security Levels to open the Edit Issue Security Levels page. Locate the appropriate security level and click its Add link (in the Operations column), which opens the Add User/Group/Project Role to Issue Security Level page. Select the appropriate user, group or project role, then click the Add button. Repeat steps 4 and 5 until all appropriate users and/or groups and/or project roles have been added to the security level. 1. Choose Projects > Projects to open the ‘Projects’ page. Select the name of the project of interest. The Project Summary page is displayed. 2. In the Permissions section of the Project Summary page, click the link corresponding to the Issues label to open the Associate Issue Security Scheme to Project page. This will either be the name of the project’s current issue security scheme, or the word None. 3. Select the issue security scheme that you want to associate with this project. 4. If there are no previously secured issues (or if the project did not previously have an issue security scheme), skip the next step. 5. If there are any previously secured issues, select a new security level to replace each old level. All issues with the security level from the old scheme will now have the security level from the new scheme. You can choose ‘None’ if you want the security to be removed from all previously secured issues. 6. Click the ‘Associate‘ button to associate the project with the issue security scheme. 1. Choose Issues > Issue Security Schemes to open the ‘Issue Security Schemes’ page, which lists all the issue security schemes currently available in your JIRA installation. 2. Click the Delete link (in the Operations column) for the scheme that you want to delete. You cannot delete an issue security scheme if it is associated with a project. To do so, you must first remove any associations between the issue security scheme and projects in your JIRA installation.